More than one in three students feel psychologically distressed, a substantial and concerning level, the creators of Canada’s longest running survey on mental health and substance use say. More than one in three students feel psychologically distressed, a substantial and concerning number, say researchers behind Canada's longest running survey on mental health and substance use. The Centre for Addiction and Mental Health (CAMH) surveyed more than 10,000 Ontario students in Grades 7 to 12 during the 2014-15 school year. In Thursday's report, CAMH found 66 per cent reported their health as excellent or very good. But the number experiencing moderate to serious psychological distress — defined as symptoms of depression and anxiety on a standard screening tool — in the past month jumped to 34 per cent in 2015 from 24 per cent in 2013, said Robert Mann, senior scientist at CAMH and co-lead investigator of the Ontario Student Drug Use and Health Survey. "We often think of the adolescent years as the prime of life where you're young, you're healthy, and these data are telling us for many young people that's not the case," Mann said in an interview. He expects the findings would be similar across Canada. Levels of high distress also increase significantly in the later teens, to an average of nearly 41 per cent of students in Grade 12. Anxiety comes up when we anticipate changes in life that leave us feeling uncertain, said Dr. Corine Carlisle, a child and adolescent psychiatrist at CAMH who was not involved in the survey. About one in five students reported visiting a mental health professional at least once during the last year, a marked increase from 12 per cent in 1999. "We might speculate that the increase in social media and the vastly wider social connectedness that that brings does amplify, I think, some of the positives and potentially some of the negatives," said Carlisle. In the survey, 86 per cent of students were on social media daily. About 16 per cent spend five hours or more a day on social media. The more time young people spend on social media sites, the greater the risk of cyberbullying, the researchers said. About 22 per cent of students reported being cyberbullied. That number has been stable since the question was first asked in 2011. Nearly a quarter of students said they were bullied at school, with verbal victimization the most common form. Exercise helps protect mental health, Mann said, and balancing screen time with other activities could help prevent some of the negative consequences. Only 22 per cent of students met the recommended daily physical activity guide of at least 60 minutes of moderate to vigorous activity during the past seven days. Carlisle said while the stress of school performance and challenges of family and peer relationships have always existed, she wonders about the added pressures of social media's constant nature. Young people often go to bed with their phones and have no downtime from social media. Social media's power to scrutinize how we look and to permanently publicize embarrassing moments can be a liability if young people forget to live in the moment as they Snapchat it, Carlisle said. That's why schools and clinics emphasize mindfulness to manage strong emotions before they tip over into distress. Young people are always watching adults, perhaps more than listening, Carlisle said. "One of the best things we can do for young people is, as adults around them, do better at managing our stress," she suggested. 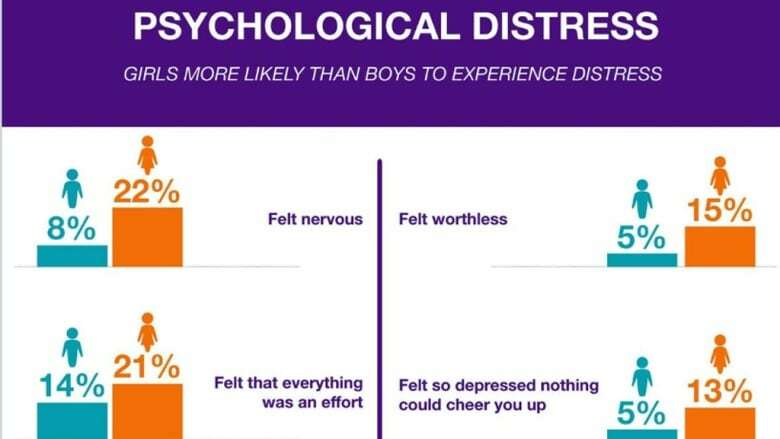 About one in five students said they had felt distress and would have spoken to someone but didn't know where to turn, which points to the need to increase awareness and resilience in young people, Carlisle said. Gwyneth Richardson, 16, of Toronto, said her anxiety manifests as a heavy chest, headaches, hyperventilating and a tight stomach. But when she went to her family doctor and therapists, her generalized anxiety disorder was considered normal teen angst. "I was worried about everything I said," Richardson recalled. "It was honestly so debilitating because it is really hard to live your life when you have this voice in the back of your head telling you that you are doing everything wrong." 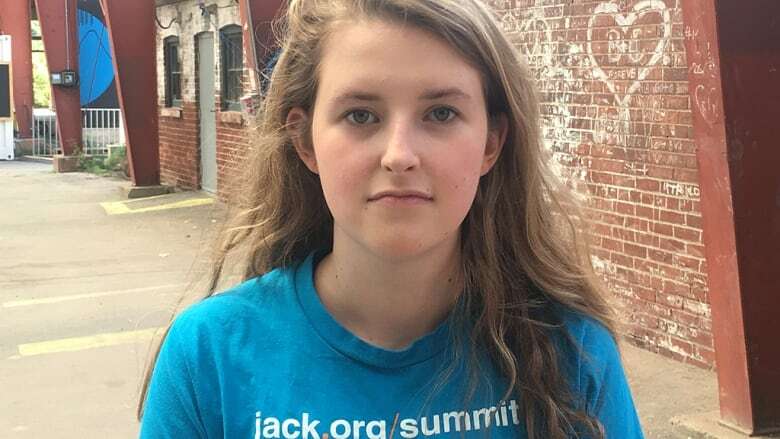 Richardson now leads a Jack.org group at her school to offer support and advocate for mental health. She said it is shocking that so many teens don't have the resources they need and don't know how to reach for help.